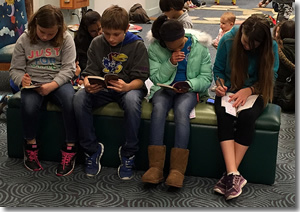 The American Library Association (ALA) is accepting applications for the Great Stories Club, a grant program in which library workers lead reading and discussion programs with underserved teens in their communities. Working with small groups of approximately 10 teens, grantees will host reading and discussion programs for up to four thematically related books. The titles — selected in consultation with librarian advisors and humanities scholars — are chosen to resonate with reluctant readers struggling with complex issues like academic probation, detention, incarceration, violence and poverty. All types of libraries are eligible, as long as they work in partnership with, or are located within, organizations that serve under-resourced youth, such as alternative high schools, juvenile justice organizations, homeless shelters, foster care agencies, teen parenting programs, residential treatment facilities and other nonprofit and community agencies. Libraries located in high-poverty communities are also eligible to apply, though outreach partnerships with youth-focused organizations are still encouraged.